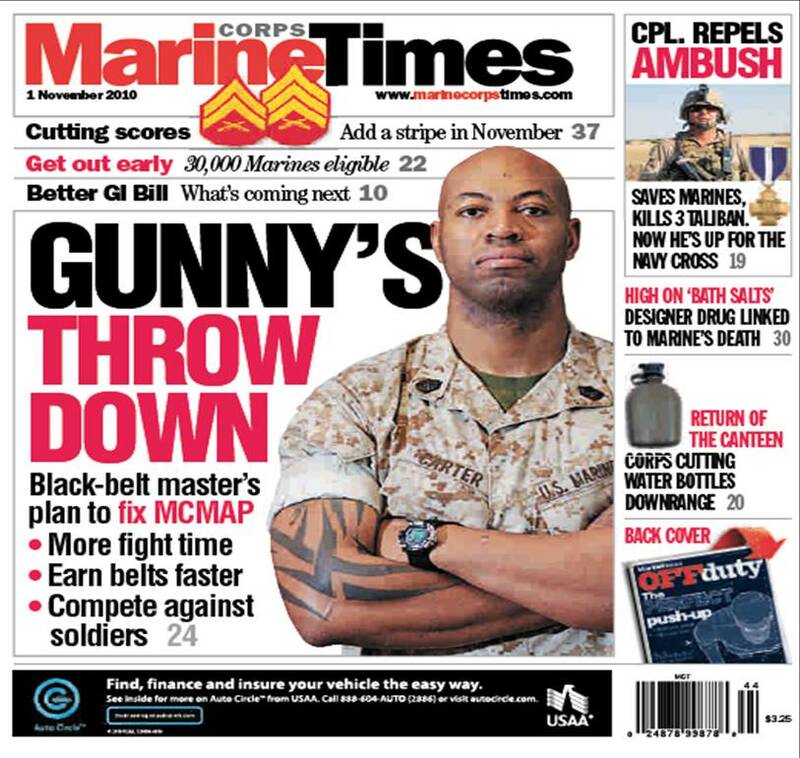 In this week’s print edition Deputy News Editor James K. Sanborn gives readers and overview of one gunnery sergeant’s innovative plan to overhaul the Marine Corps Martial Arts program by bringing mixed martial arts competition to bases and incorporating MCMAP into existing required career courses. Gunnery Sgt. Samuel Carter, a battle-hardened 3rd-degree martial arts instructor trainer based at Quantico, Va., says MMA competition, long shunned by Marine leadership, would give Marines a positive outlet to stay sharp and build morale by competing against each other and even soldiers. “That would be as good as Army-Navy football,” he said. He laid out his plan in a formal paper recently submitted to the Martial Arts Center of Excellence where he worked for several years helping to develop MCMAP curriculum. He also suggests incorporating MCMAP training into existing professional military education in an effort to reduce the overall workload on Marines while helping them advance more quickly. In short, his plan would give every Marine a chance to fight and help them earn higher belts more quickly. For all the details, pick up this week’s edition of Marine Corps Times, on newsstands now. It’s good to see someone buckling down and reaching for greater things in the MCMAP program. MCMAP is slowly being discarded as a “there is no time for that” activity when it should be held to a higher standard. MCMAP is much more than just a martial arts, it instills the practice of core values in all marines and allows marines of non combat units to help keep the fighting readiness that is required of them as a basic marine. I agree with Sgt Cleghorn. It is difficult with an ever changing work-load to commit to a MCMAP course. I understand that training and PT are important but I’m not sure if I believe MCMAP is the time to do it. EVERY Marine deserves and needs the knowledge necessary to protect themselves and others without the aide of a firearm. I myself am only a gray belt and not confident that without my rifle I would be able to take down and subdue an opponent. Frankly, the lower level MCMAP belts are almost entirely useless. And as it stands, I will not be able to earn a higher one for some time. I think MCMAP is just as if not more important than the rifle range. The reason I say this is because MCMAP aids in instilling that warrior spirit that makes Marines what they are. I fully understand that a large part of what we do as Marines is all about the shooting but without the proper mindset going in to an attack the chance of actually accomplishing the mission is minimal. I personally think MCMAP is one of the best things that has happened to the Marine Corps and if trained properly I see great things in the future for the system. On that note if not done properly and people are allowed to just slide by then the system is going to have a bunch of half arse practioners. I think GySgt Carter is spot on with wanting to create a Marine Corps MMA team and I look forward to seeing young Marines get involved and give them another reason to stay Marine and train hard. As far as the comment that lower belts are useless that couldn’t be further from the truth. If you train hard and consistant in just tan belt movemements without cluddering your mind with more movements than you ready to handle you can easily reduce an opponent with Lead hand punch,rear hand punch, front kick, round kick, eye gouge, etc….. If you were to truly master tan belt it has everything you need to keep the fight basic. MCMAP/Martial Arts: Its Citizen Training. A win win for everyone.